Physical and chemical barriers form the first line of defense when the body is invaded. The skin has thick layer of dead cells in the epidermis which provides a physical barrier. Periodic shedding of the epidermis removes microbes. The mucous membranes produce mucus that trap microbes. Defecation and vomiting -expel microorganisms. The microbe attaches to the phagocyte. The phagocyte's plasma membrane extends and surrounds the microbe and takes the microbe into the cell in a vesicle. The vesicle merges with a lysosome, which contains digestive enzymes. The digestive enzymes begin to break down the microbe. The phagocyte uses any nutrients it can and leaves the rest as indigestible material and antigenic fragments within the vesicle. The phagocyte makes protein markers, and they enter the vesicle. The indigestible material is removed by exocytosis. The antigenic fragments bind to the protein marker and are displayed on the plasma membrane surface. The macrophage then secretes interleukin-1 which activates the T cells to secrete interleukin 2, as described below under specific resistance . Fever inhibits bacterial growth and increases the rate of tissue repair during an infection. The third line of defense is specific resistance. This system relies on antigens, which are specific substances found in foreign microbes. Most antigens are proteins that serve as the stimulus to produce an immune response. The term "antigen" comes from ANTI-body GENerating substances. When an antigen is detected by a macrophage (as describe above under phagocytosis), this causes the T-cells to become activated. The activation of T-cells by a specific antigen is called cell-mediated immunity. The body contains millions of different T-cells, each able to respond to one specific antigen. The T-cells secrete interleukin 2. Interleukin 2 causes the proliferation of certain cytotoxic T cells and B cells. From here, the immune response follows 2 paths: one path uses cytotoxic T cells and the other uses B cells. The cytotoxic T cells are capable of recognizing antigens on the surface of infected body cells. The cytotoxic T cells bind to the infected cells and secrete cytotoxins that induce apoptosis (cell suicide) in the infected cell and perforins that cause perforations in the infected cells. Both of these mechanisms destroys the pathogen in the infected body cell. Click here for an animation on cytotoxic T cells. T-cells can either directly destroy the microbes or use chemical secretions to destroy them. At the same time, T cells stimulate B cells to divide, forming plasma cells that are able to produce antibodies and memory B cells. Click here for an animation on the immune response. The animation is followed by practice questions. Antibodies (also called immunoglobulins or Ig's) are Y-shaped proteins that circulate through the blood stream and bind to specific antigens, thereby attacking microbes. The antibodies are transported through the blood and the lymph to the pathogen invasion site. Each antibody is made of four polypeptide (protein) chains: 2 heavy chains and 2 light chains. Both heavy chains are identical to each other and both light chains are identical to each other. Each contains a constant region and a variable region. The constant region forms the main part of the molecule while the variable regions forms the antigen-binding site.Each antibody has 2 antigen-binding sites. 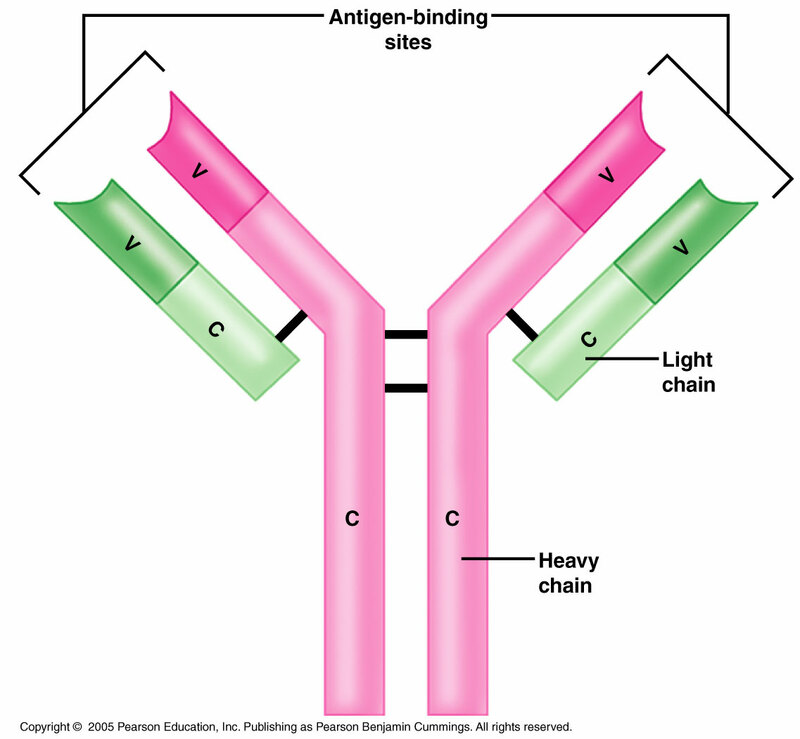 The antibody can bind to an antigen, forming an antigen-antibody complex. This forms a shield around the antigen, preventing its normal function. 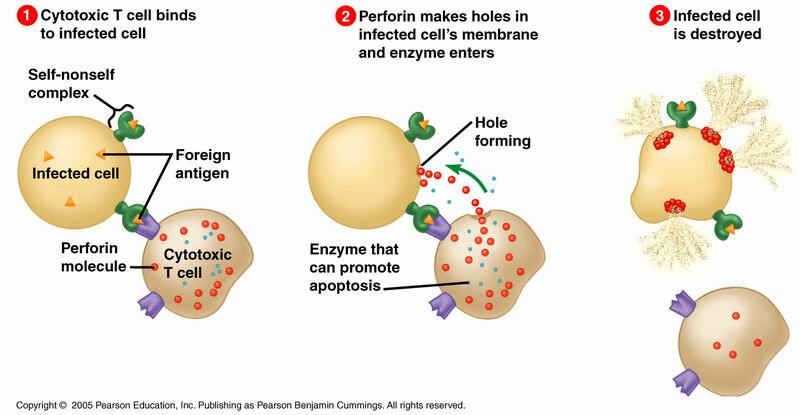 This is how toxins from bacteria can be neutralized or how a cell can prevent a viral antigen from binding to a body cell thereby preventing infection. Complement is a group of plasma proteins made by the liver that normally are inactive in the body. 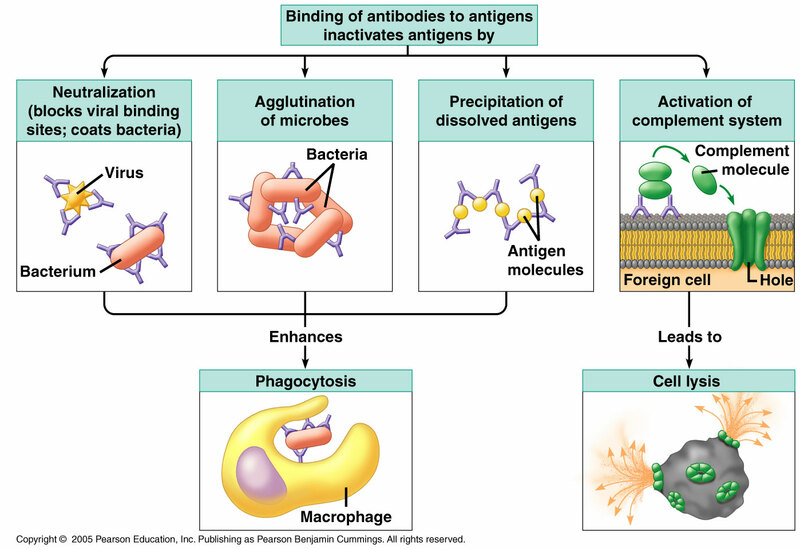 An antigen-antibody complex triggers a series of reactions that activates these proteins. Some of the activated proteins can cluster together to form a pore or channel that inserts into a microbe's plasma membrane.This lyses (ruptures) the cell. Other complement proteins can cause chemotaxis and inflammation, both of which increase the number of white blood cells at the site of invasion. Sometimes the antibodies can bind to the same free antigen to cross-link them. This causes the antigen to precipitate out of solution, making it easier for phagocytic cells to ingest them by phagocytosis (as describe above). Also, the antigens within the cells walls of the bacteria can cross-link, causes the bacteria to clump together in a process called agglutination, again making it easier for phagocytic cells to ingest them by phagocytosis. The antigen-antibody complex signals phagocytic cells to attack. The complex also binds to the surface of macrophages to further facilitate phagocytosis. These cells secrete cytotoxin which triggers destruction of the pathogen's DNA or perforin which is a protein that creates holes in the pathogens plasma membrane. The holes cause the pathogen to lyse (rupture). These cells secrete interleukin 2 (I-2) which stimulates cell division of T cells and B cells. In other words, these cells recruit even more cells to help fight the pathogen. These cells remain dormant after the initial exposure to an antigen. If the same antigen presents itself again, even if it is years later, the memory cells are stimulated to convert themselves into cytotoxic T cells and help fight the pathogen.